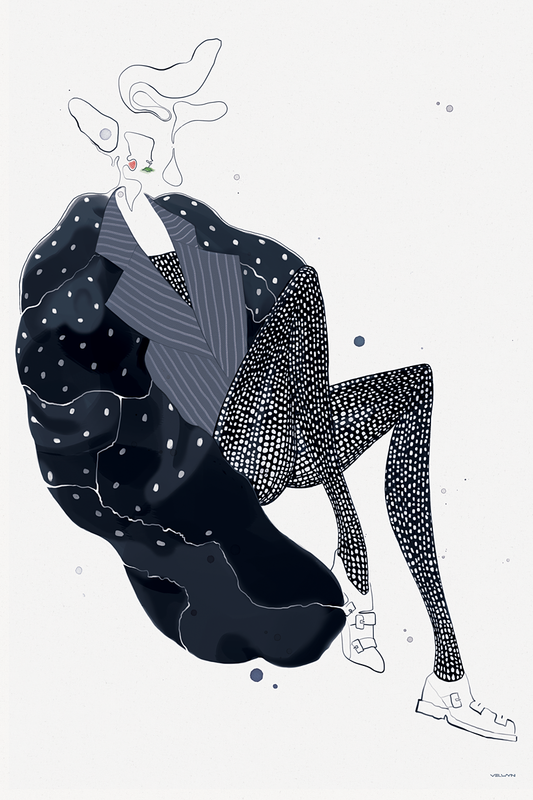 Velwyn Yossy is a London and Los Angeles based creative who works across the borders of illustration, design and fashion. 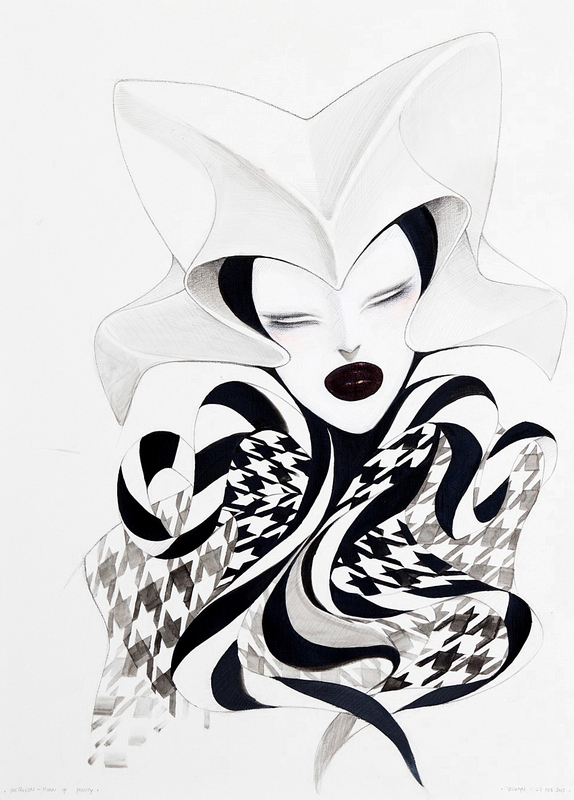 She has been working in the field of motion design as well as living her passion as a fashion illustrator and artist. Her commercial clients include Psyop TV, Nexus Productions, Disney Interactive and Pocko. Recently she has been commissioned by Nick Knight’s SHOWstudio to cover London Fashion Week and the Unseen McQueen project coinciding with the Alexander McQueen – Savage Beauty exhibition at the V&A museum. Tell me where you are right now? I am currently sitting in my living room, in Gipsy Hill, South London. You recently live-illustrated several fashion shows for SHOWstudio during London’s Fashion Week, can you describe your process in the hectic environment? I remember being really anxious two weeks beforehand, as I never live-illustrate in the past. On the first day, I was tense and excited at the same time but I tried my best to stay focus. But after being there for a couple of hours, I became more relaxed and forgot that the camera is right next to me. Your illustrations are simplistic, clean, yet technically complex and your fashion illustrations are too, but they have a different identity. Can you talk a little about approaching different aesthetics for different genres of illustration? Sometimes it depends on what the client is looking for, the creative director usually gives me a brief that would fit to what they are looking for and sometimes they are not my natural style, but as long as I like the aesthetics, I won’t mind trying and experimenting. To me, working under a specific visual reference is like imitating someone’s signature but I still put an effort to make it to fit my taste. Sometimes it’s quite fun to learn things that I wouldn’t learn otherwise. 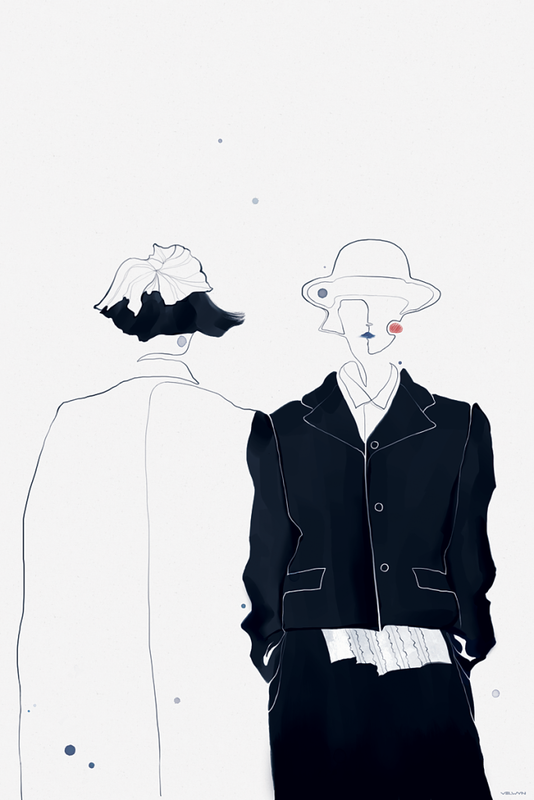 As for fashion illustrations, I usually go with my gut feeling or my mood at that time. You moved around places when you were growing up, could you describe how it affects your work aesthetics? I was really influenced by Japanese manga arts when I grew up. Then when I moved to the U.S, I learned about the pragmatic side (as well as the commercial side) of art and design in college. Currently, I am influenced by the creativity and fearlessness of the London fashion scene. I think moving around places subconsciously opened up my mind in understanding the infinite possibility of whatever I can do. I notice for a long time that without losing your focus, you like to jump around art and design mediums. Do you still do this? I think I still do, between traditional and digital medium, though it would be nice if I could branch to animation or see my work in a more tactile form as well. What do you think about experimentalism? And do you frequently experiment with aesthetics? I still like to experiment rather than sticking to a particular style (which I find personally limiting). Perhaps there’s an inner fear of not wanting to be ‘stuck’ somewhere, as well as the curse of being bored quite easily. I just think that there’s just so much to absorb from this world. Another good reason for me to experiment is to find out what works and what doesn’t. In a way, each time I explore and challenge myself, the more I learn about what I feel I’m most satisfied with and whether or not it will change in the future, is another matter. In general, I don’t like to be limited by rules or to be told what an illustrator should be.